The genus Pelargonium L. is a rather big one and is comprised of ~270 species. The majority are found in the southern part of the African continent, i.e. the Republic of South Africa and Namibia, and of these, ~80% are native to the south-western corner in the area of winter rainfall. However, the distribution of the genus extends further north throughout the East African countries: Zimbabwe, Malawi, Tanzania, Kenya, Ethiopia and to the Arabian subcontinent (Yemen). Some species ventured futher North and are found in East Turkey and the Middle East (Iraq, Iran). A couple of species are endemic to Madagascar (P. caylae Humbert, P. madagascariense Baker), one to the island of St. Helena (P. cotyledonis (L.) L'Herit. ), one to the Tristan da Cunha island (P. acugnaticum Thouars), and a few species furthermore grow in Australia, Tasmania and northern New Zealand. According to Knuth, the Geranium family (cf. below) is composed of five subfamilies: Geranioideae, Biebersteinioideae (Biebersteinia), Dirachmoideae (Dirachma), Vivianioideae (Viviania), and Wendtioideae (Bulbisia, Wendtia and Rhynchotheca), the latter two sometimes separately regarded as families Vivianiaceae and Ledocarpaceae, respectively. Some botanists regard the subfamily Geranioideae as a separate family, Geraniaceae Juss. Comon to all Geranioideae genera, Erodium, Geranium, Monsonia, Sarcocaulon and Pelargonium is the characteristic dehiscent fruit, which resembles, with some imagination, a crane's bill, hence its name from Greek. Similarly, the word pelargos (stork) was chosen to best describe the fruit of pelargoniums. 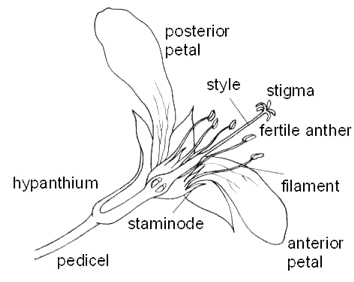 In pelargoniums, the ovary consists of 5 mericarps - carpels (i.e. it is 5-locular), which on fertilisation elongate. The fruit is a schizocarp, a dry fruit form intermediate between dehiscent and indehiscent types, in which each carpel matures into a single-seeded unit. The fruit is composed of five mericarps, each containing one seed. 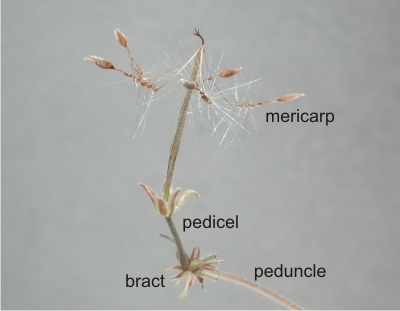 On maturity, the mericarps split apart (dehisce), the plumed seed is ejected, and may be spread by wind or animals. Some familiy representatives are commercially important as sources of geranium oil (P. graveolens, P. odoratissimum, P. capitatum, P. radula), used in food and perfume industries, and as horticultural subjects 'geraniums'. Most 'geraniums' are descendants of P. zonale and P. inquinans, but also of P. cucullatum, P. fulgidum and P. grandiflorum. Species of Erodium and Monsonia are popular in rock gardens. Species of Sarcocaulon are widely grown by succulent plant enthusiasts, and many photographs of these are scattered across the Pelargonium Page as well. 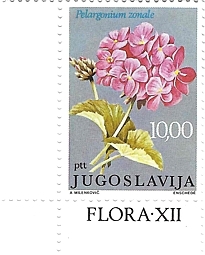 An illustation of P. zonale that isn't: a Yugoslavian postal stamp from 1977, depicting a hybrid of P. zonale descendance. 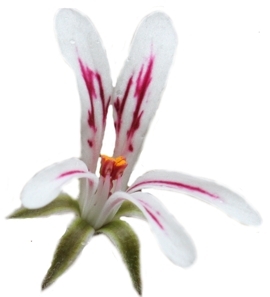 Pelargonium flowers differ from those of other genera in having the upper two (posterior) petals differentiated from the lower three (anterior) petals. Furthermore, the posterior sepal is modified in the way that it is fused with the pedicel in a different way to the others, forming the hypanthium - the nectary tube. Its length is characteristic, from a few milimeters to a few centimeters and has significant diagnostic value. Furthermore, there are 2-7 fertile stamens (Erodium always 5, other genera 10 or more), their number, curvature and position with regard to infertile stamens or staminodes also being very important. The style is divided into five stigmas which become receptive after the anthers of the flower have dehisced, thus avoiding self-pollination. The flowers are arranged in umbels, which are sometimes branched, and since the oldest flower is in its middle, the inflorescence is sometimes referred to as pseudo-umbel. The following description of the genus is adapted from van der Walt, J. J. A.: "Pelargoniums of Southern Africa", Vol. 1, Purnell, Cape Town, 1977. Seeds More or less oblong-obovoid; endosprem absent; embryo curved. A family of herbs or low shrubs, rarely tree-like, that have alternate lobed or compound stipulate leaves. The flowers are regular, usually pentamerous with free petals and sepals, and usually with twice as many stamens as petals, a superior 3-5-celled ovary, and usually a long beak bearing the free stigmas. The fruit is a lobed capsule, the lobes usually 1-seeded, sometimes separating. There are 14 genera with about 730 species, in temperate and tropical zones. P. x schottii is one of the early species hybrids (thought to be with P. lobatum) produced in the 19th Century, illustrated in Curtis's Botanical Magazine in 1869. Species in some sections hybridize freely in nature (let alone in greenhouses), e.g. P. laxum, P. carnosum or P. parviflorum and it is often very difficult to identify them. In addition, many cultivated succulent species assume growth forms that are quite un-natural.